Motorola is soon going to launch its high-end premium phones of this year very soon, and we are already aware of the design of the upcoming Moto Z2 and Z2 Force. One of the highlights of the Moto Z2 is the dual rear camera on the back. Today, the phone has been spotted on the benchmarking platform, Geekbench that reveals some of the specifications like Android version, Processor, and RAM. The phone’s scores show that it is going to be a tough competitor for the latest premium phones of this year like the Galaxy S8, LG G6, Mi6, Nubia Z17, etc. First of all, the listing confirms that the phone has an octa-core Snapdragon 835 processor, clocked at 1.9GHz. There is 4GB of RAM, and the phone runs on the Android 7.1.1 Nougat out of the box. As mentioned above, the listing didn’t reveal much. Now, coming to the scores, the phone scored 1879 on Single core and 6503 on Multi-Core. These are, in fact, good scores if we compare these with Mi6 and HTC U11’s Geekbench scores. But, the device isn’t better regarding scores if we compare it with the Galaxy S8 that scored 7K+ on Multi-Core. What are your views? Do let us know via the comments section. 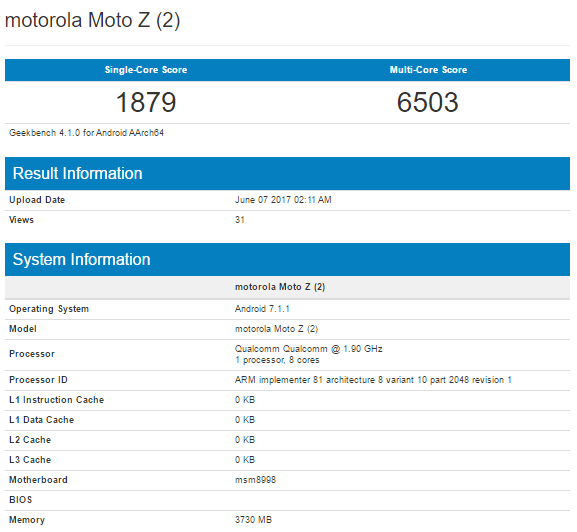 I’m pretty sure that there won’t be a skinny (5.2mm) Moto Z2 this year. The Z2 Play went from 7mm thick to 6mm thick with a 15% smaller battery and will be the standard bearer and there will be a Z2 Force that should be about the same thickness as last year.